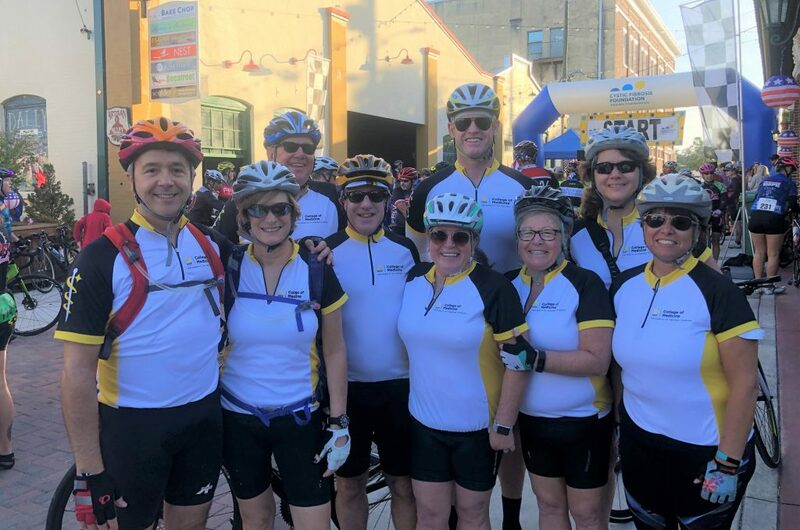 A nine-member team of UCF College of Medicine faculty physicians, staff and their supporters mounted their bicycles Nov. 11 to fight cystic fibrosis, a genetic lung disease that affects approximately 30,000 Americans. Led by Dr. Marcia Katz, a pulmonologist, cystic fibrosis specialist and associate dean for clinical affairs, “The Knight Rider” won Rookie of the Year honors for raising money at the Central Florida Cystic Fibrosis Foundation’s Cycle for Life race in Deland. The award goes to a first-time entrant that raises the most money. The team raised $2,350. The Knight Riders won the award for the Rookie of Year for raising the most money for a first time entrant, and included College of Medicine faculty physicians, Drs. Juan Cendan, Judy Simms-Cendan, Jane Gibson, as well as assistant dean of finance Steve Omli. Each year, hundreds of physicians, patients, family members and supporters join forces to raise money for cystic fibrosis research. The ride takes participants through picturesque and scenic terrains in Central Florida, with route options of 35, 65, and 100 miles. Cystic fibrosis is a progressive disease that limits a person’s ability to breathe over time. A defective gene causes a thick, sticky buildup of mucus in the lungs, pancreas, and other organs. In the lungs, the mucus clogs the airways and traps bacteria leading to infections, extensive lung damage, and eventually, respiratory failure. In the pancreas, the mucus prevents the release of digestive enzymes that allow the body to break down food and absorb vital nutrients, so patients sometimes suffer from malnutrition. More than 75 percent of patients are diagnosed by age 2 and have a shorter than average lifespan. Dr. Katz sits on the board of the Central Florida Cystic Fibrosis Foundation and previously served as medical director for the Adult Cystic Fibrosis Center at Baylor College of Medicine for 15 years. She says fundraisers like Cycle for Life have supported research that led to the development of medications that treat CF symptoms but the underlying genetic defects that cause the disease. Dr. Katz said the team is looking forward to participating and raising even more funds at next year’s event.